Enter for your chance to win 6 "VIP" seats to a Weekend game, throw a Ceremonial First Pitch, and watch the fireworks after the game! 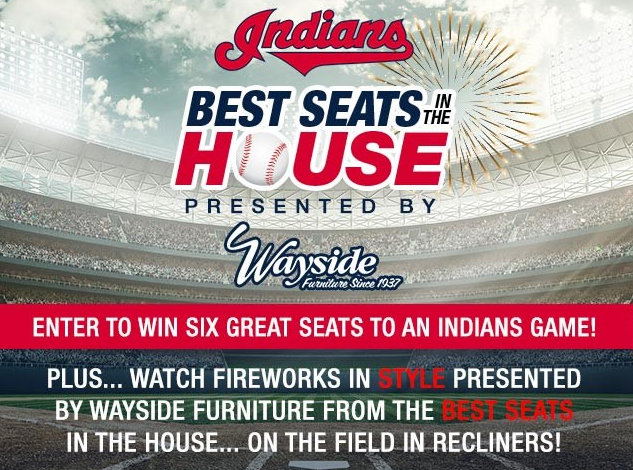 One (1) fan will be selected to throw out a ceremonial first pitch, receive (6) tickets to the game, and watch post-game fireworks at Progressive Field in a Wayside Furniture Recliner. Total of (3) grand prize winners. All entries received on or before Friday, June 14th, 2019 will be eligible to win prizes for the game on Friday, June 21st, 2019. All entries received on or before Friday, July 12th, 2019 will be eligible to win prizes for the game on Saturday, July 20th, 2019. All entries received on or before Friday, August 16th, 2019 will be eligible to win prizes for the game on Saturday, August 24th, 2019.